The dig at the “Asvestaria” site in Petroto, Trikala began as a rescue excavation due to the construction of the Larisa–Trikala national highway where a Late Bronze Age settlement came to light. The excavation research carried out during the five year programme provided interesting data on the settlement’s use of space over the centuries. The case of the Petroto settlement is the only known example in West Thessaly of a Final Neolithic or even earlier settlement whose life continued uninterrupted to the end of the Bronze Age. Apart from the discovery of locally produced ceramics, there was a remarkable number of “imported” vases from Argolis and Crete. 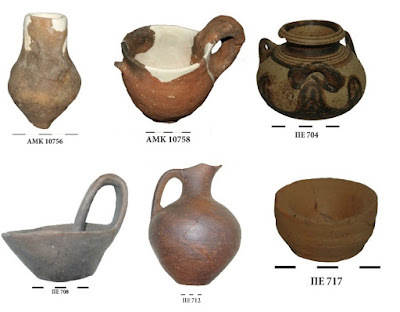 In the local ceramics of the LHX period which have their particular characteristics regarding the clay and the distinctive handles, the Middle Helladic tradition can be traced even in the shape of the vessels.